Mathematical models can be used as health policy tools to predict the emergence and transmission of antiviral resistance [1–5]. These models have predicted, that if treatment rates are high, that high levels of antiviral resistance to HIV will arise very quickly; for example, 42% of HIV cases in San Francisco are predicted to be infected with drug-resistant strains by 2005 [3, 4]. These theoretical predictions have been compared with empirical data, and shown to be valid [4, 6]. In stark contrast to the HIV predictions, it has been predicted that high usage of antivirals to treat Herpes Simplex Virus type 2 (HSV-2) would only lead to low levels of resistance (in immunocompetent populations) [1, 2]. These predictions were based upon the assumption that drug-resistant strains of HSV-2 would be less infectious than drug-sensitive strains, but that the drug-resistant strains would not be impaired in their reactivation ability. However, recent experience with drug-resistant variants has shown that the majority of these variants are deficient in the expression of thymidine kinase [7–9], a phenotype that is known to be associated with a reduced ability to reactivate [8–10]. Here, we model the effect of impaired reactivation ability of drug-resistant strains and generate new predictions for the expected emergence of antiviral resistance to HSV-2. We also assess the beneficial and the potential detrimental epidemic-level effects of a high usage of antivirals by conducting a "biological cost-benefit" analysis and calculating the value of a treatment evaluation criterion (TEC(t)). We compare our new predictions for the expected levels of drug resistant HSV-2 and TEC(t) with previous predictions. We used a previously published mathematical model to track the effect of a high usage of antivirals on the transmission dynamics of drug-sensitive and drug-resistant HSV-2 strains in an immunocompetent population [1, 2]. We model the effect of episodic treatment on epidemic viral dynamics; hence treatment occurs only during an infectious outbreak and reduces the length of the infectious period (which reduces the possibility of transmission of HSV-2). Thus, the greater the treatment rate (in terms of the number of infectious episodes treated) then the greater the reduction in transmission. The possibility of transmitted (i.e., primary) resistance emerging, as well as the development of both temporary and permanent acquired drug resistance are included in the model. Individuals with permanent resistance are assumed to reactivate with drug-resistant HSV-2 strains during each subsequent outbreak. Individuals with transient resistance are modeled by assuming that they only present with drug resistance during the episode in which they acquire resistance; hence, all of their subsequent infectious outbreaks are drug-sensitive. Details of the model, which is specified by a series of six ordinary differential equations, are given elsewhere [1, 2]. A web-based version of this model can be run at http://www.biomath.ucla.edu/faculty/sblower. To generate our predictions we analyzed the model using time-dependent uncertainty analyses [1–5], [11–13]. These analyses were based upon Latin Hypercube Sampling (LHS), a sampling technique that enables us to make predictions using a range of parameter values for each parameter. Hence, each parameter is specified by a probability distribution function (pdf) rather than a single value; the pdfs that we used have been reported and discussed previously . Each pdf was randomly sampled, without replacement, 1,000 times. Predictions were generated by simulating the model 1,000 times using the parameter values sampled by LHS; methodological details are given elsewhere [1–5], [11–13]. We predicted the effect of 1,000 drug-sensitive strains of HSV-2 that each differed in their infectivity and reactivation ability. In terms of infectivity, the transmission probability of drug-sensitive strains was assumed to lie between 0.1 and 0.5 . In terms of reactivation ability, drug-sensitive strains were assumed to cause anywhere from one to 20 (with a most likely value of 12) viral shedding infectious episodes per year ; these viral shedding episodes could be either symptomatic or asymptomatic. We used sampling constraints during the LHS to construct 1,000 different drug-resistant HSV-2 strains that were attenuated in comparison with the drug-sensitive strains with respect to both infectivity and reactivation ability. 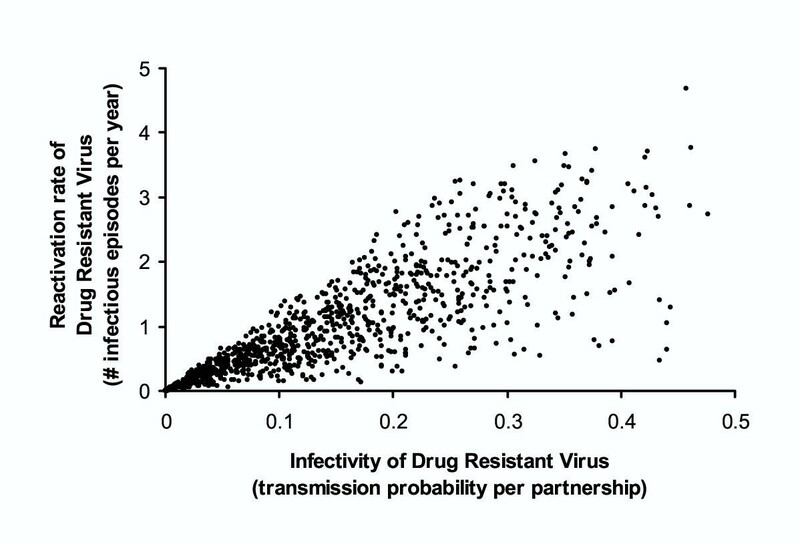 The relationship βR = αβS (where α was a random variable uniformly distributed between zero and one and βR and βS specified the infectivity (i.e., transmission probability) of drug-resistant and drug-sensitive strains respectively) was used to determine the infectivity level of drug-resistant strains. Attenuation in reactivation ability was derived in a similar manner by multiplying each of the 1,000 drug-sensitive reactivation rates (that had been obtained by LHS) by a randomly selected weighting factor (Η ; where 0 < Η < 0.25 with uniform pdf). Since most drug-resistant variants that have been studied are TK deficient and are attenuated both in infectivity and reactivation ability , we included sampling constraints so that infectivity and reactivation ability were positively correlated. This sampling procedure ensured that the 1,000 drug-resistant strains that we constructed ranged in their reactivation ability from 0–5 reactivations per year, and that the transmission probabilities ranged from (0.1 to 0.5) (as shown in Figure 1). Biological attributes of the 1,000 strains of drug-resistant HSV-2 that were constructed using sampling constraints and LHS. Strains were generated to produce a strong positive correlation between the number of infectious episodes (NE R) and the transmissibility (βR) of the drug-resistant strain. The correlation coefficient (r) of this data set is 0.83. We then simulated the model and predicted the levels of drug resistance that would emerge, assuming that antiviral usage was high (i.e., that 10–50% of the individuals who were shedding virus at any particular time could receive episodic treatment). In order to compare with previous predictions we predicted the temporal dynamics of: (i) the prevalence of drug-resistant infectiousness and (ii) the value of the Treatment Evaluation Criterion (TEC(t)) where TEC(t) equals the average number of drug-sensitive cases prevented at time t per prevalent case of drug resistance . Thus, a value of TEC(t) of greater than one represents a net beneficial effect of antiviral usage at the epidemic level (i.e., more than one drug-sensitive case of HSV-2 is prevented for each prevalent case of drug resistance ). The 1,000 theoretical drug-resistant strains of HSV-2 that we constructed were attenuated in both their infectivity and the ability to reactivate; sampling constraints ensured that infectivity and the average number of infectious episodes per year were positively correlated (Figure 1). The temporal dynamics of the predicted prevalence of drug-resistant HSV-2 is shown in Figure 2A; blue data show the previously published predictions  that assume that drug-resistant strains would be attenuated only in infectivity, and red data show the new predictions that assume that drug-resistant strains would be attenuated in both infectivity and reactivation ability. Prevalence is plotted as a percentage of the total population, thus the maximum value of 0.8% on the y-axis reflects 8 infections per 1,000 individuals. As has been shown previously , even with very high rates of antiviral usage only low levels of drug resistance are predicted to emerge even over a period of decades (blue and red data; Figure 2A). Previously (under the assumption that drug-resistant strains will only be attenuated in their ability to infect) it was predicted that only 7 in 1,000 individuals (blue data at 25 years; Figure 2A) are expected to be shedding drug-resistant strains. However, our new predictions that assume that drug-resistant strains will be less infectious and less likely to reactivate (red data; Figure 2A) are an order of magnitude lower than these previous predictions; only 5 out of 10,000 individuals are predicted to be shedding drug-resistant virus (red data at 25 years; Figure 2A). Results of the uncertainty analyses using a previously published transmission model [1, 2]. Blue data are predictions published previously (and described in detail in reference 1) assuming that viral attenuation in drug-resistant strains reduces only infectivity (in comparison with drug-sensitive strains). Red data are the new predictions assuming that viral attenuation in the drug-resistant strains reduces both infectivity and reactivation ability. (A) The median value of the 1,000 simulations in the uncertainty analysis is plotted. The prevalence of drug-resistant infectiousness (i.e., the prevalence of the individuals who are shedding drug-resistant HSV-2) is shown. (B) Predictions for the Treatment Evaluation Criterion (TEC(t)) is shown; the median value of the 1,000 simulations in the uncertainty analysis is plotted. Previous estimates (blue data; Figure 2B) show that even after 25 years of high antiviral usage 4.5 cases of HSV-2 would be prevented for each prevalent case of drug-resistant HSV-2. 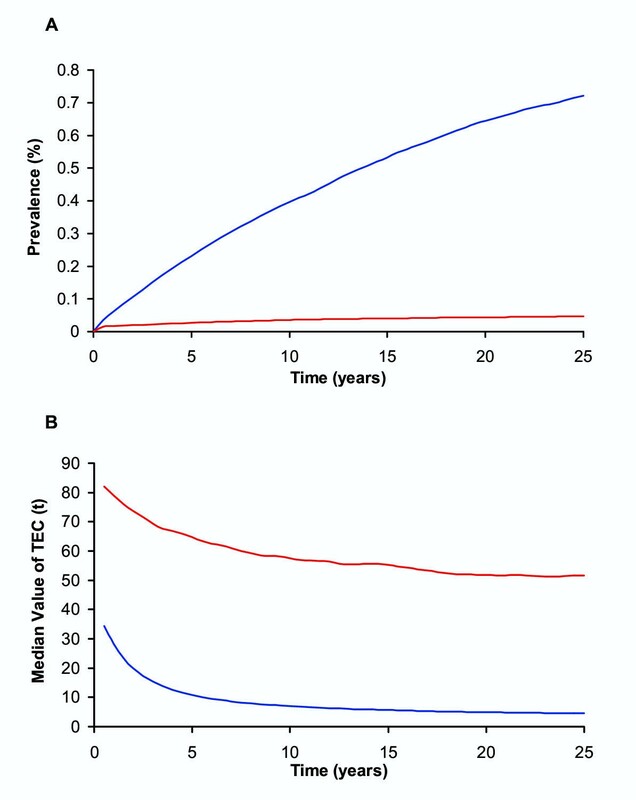 Our new results (red data) show that if the drug-resistant strains are attenuated in both their ability to infect and reactivate then the value of TEC would be even greater; after 25 years 52 cases of HSV-2 would be prevented for each prevalent case of drug-resistant HSV-2. Here we have predicted the emergence and transmission of antiviral resistance in the immunocompetent population (i.e., the "general population"). More complex models could be developed to assess the emergence and transmission of drug-resistant HSV-2 strains in a population that contains both immunocompetent and immunocompromised individuals. Acquired resistance occurs with a much greater probability in immunocompromised individuals (in comparison with imunocompetent individuals) due to a variety of host, virological and treatment factors ; hence the prevalence of resistant HSV-2 in samples of immunocompromised individuals has already been reported to be 4–7% . It is unlikely that drug-resistant HSV-2 cases in immunocompromised individuals will lead to significant increases in drug resistance in the immunocompetent population unless very transmissible strains of drug-resistant HSV-2 arise and considerable sexual mixing occurs between immunocompromised and immunocompetent individuals. Mathematical models can be very useful in predicting the spread of antiviral resistance [1, 4, 15]. We have shown previously [1, 2] that a substantial increase in antiviral usage in immunocompetent populations would have a substantial beneficial impact on herpes epidemics in terms of preventing new infections, and have a negligible detrimental impact in terms of generating drug resistance (i.e., TEC(t) >> 1). Our new predictions for the emergence of drug resistant HSV-2 (where we have included the assumption that drug resistant strains of HSV-2 will have an impaired ability to reactivate) are an order of magnitude lower than previous predictions. Our results suggest that the very low levels of drug-resistant HSV-2 that have been observed sofar in the "real-world" in the immunocompetent population [8, 14] are not unexpected, and also are not likely to increase. Given the low levels of drug resistance that are to be expected (5 per 10,000 immunocompetent individuals) it seems unlikely that cases of drug-resistant HSV-2 that arise in the immunocompetent population will be detected unless extremely large-scale surveillance systems are put in place. We thank the National Institute of Allergy & Infectious Diseases (Grant #: R01-AI41935 to SMB), and the Centers for Disease Control (Grant #: R18/CCR915950 to SMB) for financial support. SMB conceived the study & designed the analysis, HBG performed the numerical computations. SMB & HBG drafted the manuscript. GD participated in the design, the interpretation of results, and drafting the manuscript. All authors read and approved the final manuscript.